Want to dine in the vineyard or at a winery restaurant? It's getting easier as more and more wineries open a cafe or restaurant as an added attraction for visitors. Vine Dining in New Zealand ranges from simple platter style food to full a-la-carte, from outdoor alfresco to luxury white table cloth dining. Bookings are recommended in the busy season and probably preferred at any time by the Vine Dining hosts. Information provided on this page was obtained from winery websites and was correct at the time of publication. Where it says that restaurants are open daily, some may be closed on statuatory holidays such as Good Friday, Christmas Day and Boxing Day. Check before arriving. Winery restaurants are listed from north to south. Click on the website links for more detailed information. Karikari Estate Platter style lunches served at the winery and gourmet dining in the evening at Carringtons. Ake Ake Vegetarian and Seafood with lunches served from Wednesday to Sunday. Marsden Estate Restaurant open seven days a week. Cottle Hill Cafe open December to March serving platters and fresh homemade desserts. Omata Lunch and Dinner, including the Chef's Bench for two to six people. Ascension Cafe open daily in the summer, closed on Mondays and Tuesdays in the winter. Dinner served Thursday , Friday and Saturday. Check out my review. Brick Bay Wines The Glasshouse, gateway to the Brick Bay Sculpture Trail, opens daily serving platters. 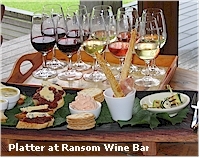 Ransom Wines The Wine Bar is open Tuesday to Sunday serving platter food. Check out my review. Herons Flight The new restaurant at the Heron's Flight Winemakers Centre opens daily. Check out my review. Omaha Bay Vineyard Currently open Wednesday to Sunday. Blackboard menu. Soljans Wines Cafe open daily from 10am weekdays and 9am weekends. Check out my review. Matua Valley (The Hunting Lodge) Fine Dining - Wednesday to Sunday. Artisan Wines - Open Daily. Light food and coffee. Cable Bay - Restaurant serves lunch Tuesday to Sunday and dinner Thursday to Saturday. Goldwater Estate - Long Lunch the last Friday of each month. Mudbrick - Retaurant open daily. Check out my review. Stonyridge - Cafe opens daily in summer, and from Friday to Sunday in winter. Te Motu - Seasonal hours. Saturday and Sunday only in winter, tuesday to Sunday in summer. Mystery Creek - The almost brand new Woodbox Restaurant and Bar opens Wednesday to Sunday. Ohinemuri Estate - Cafe and Wine Tasting. Open daily in the 'high summer' and from Wednesday to Sunday other times. Morton Estate - Mortons Restaurant is open Wednesday to Sunday for lunch. Huka Falls Winery Huka Falls Restaurant opens daily for lunch year round. Lindauer Cellars at Montana Wines - Alfresco and covered dining 7 days a week Note: Will close in Feb 2008. Black Barn - Black Barn Bistro is open for lunch, Wednesday thru Sunday. Check out my review. Bradshaw Estate - Lunch 7 days.Dinner Friday and Saturday. Craggy Range - Terroir Restaurant open daily in summer, closed Mondays in winter. Check out my review. Sacred Hill - Open 2 months in the summer each year. Picnic lunches available. Check out my review. Sileni Estate - Open for lunch 7 days. Gladstone- Cafe open Thursday to Sunday and public holidays. Coney - Vineyard Cafe open most weekends and public holidays. Murdoch James - Riverview Cafe is open Fri to Sun in Winter, and Thurs to Monday in summer. Okurukuru Estate - Cafe open Tuesday to Sunday for a-la-carte dining and nibbles. Gibbs Vineyard Restaurant - Open for dinners daily from November through April. Closed Mondays in the winter. Hunters - Marlborough's first vineyard restaurant - open daily for lunch. Montana Brancott Winery - Restaurant open daily. Degustation platters a speciality. Whitehaven - Open 7 days for lunch and dinner. Kahurangi Estate - Cafe open for Alfresco style lunch from Wednesday to Sunday. Seifried - Vineyard Restaurant open daily for lunch. Check out my review. Stafford Lane - Platters of estate produced olives, olive oil, hazelnut dukkah and chutney. Waimea Estate Cafe in the Vineyard open 7 days in summer, Wednesday to Sunday in winter. Kaikoura Winery - Gourmet platters, soup, cheese tastings, toasties and BBQ available 7 days. Waipara Springs - Wine Bar and Cafe open every day, except at Christmas. Check out my review. The Mud House Winery and cafe open daily. They own and sell several wine brands at the cellar door, including Mud house, Waipara Hills & Canterbury House. Pegasus Bay- Restaurant open for lunch 7 days. Check out my review. French Farm - Dining every day in the Restaurant or more casually from La Pizzeria in the summer. Check out my review. Hinton's Vineyard, Restaurant and Cafe - Although in Christchurch, this is the cellar door of Central Otago's Hinton Estate. Open from 9am for breakfast with lunch served from 11.30am. The restaurant is also available for private groups in the evenings. Langdale Vineyard Restaurant - Open Wed - Sun 11.00am - 4.00pm. Evenings by arrangement. Bookings essential. Specialises in Canterbury Wines. Melton Estate - Restaurant open Friday to Sunday for lunch. Rossendale Country Restaurant and Winery - Open daily for lunches (except some statuatory holidays) and most nights for dinner. Opihi Estate - Vineyard Cafe open Tuesday to Sunday for lunch. Gibbston Valley - Open for lunch daily. Group buffet options available. Check out my review. Waitiri Creek- check with winery for cafe opening times. The Big Picture - Restaurant and Cafe open daily. Check out my review.